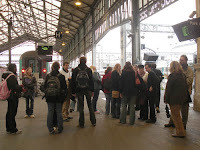 The best thing about our hotel in Tours was its location alongside the train station. So when we left for the city of Blois and its chateau we only had to cross the street! Unfortunately the weather gods had abandoned us, although the rain was kind enough to let us walk to and from the chateau in relative dryness. Blois as a chateau contains architectural elements from the medieval defensive foundations to the elegant high Renaissance wing and several periods in between. It was the center of royal power until Henry IV moved his court to Paris in 1598. 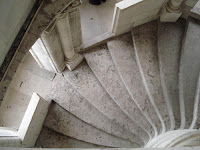 The most renowned part of the chateau is the François Ier spiral staircase, which you use to access the various levels of the chateau. 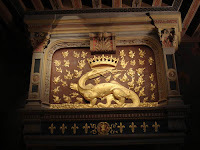 The salamander images you see everywhere are his emblem. His motto was “Nutrisco et extinguo” -- I nourish and I extinguish. We climbed up and down the stairs and then up and down the hill leading into the town, which also maintains some medieval elements.